The Triple Crown for Heart ride is now 4 years old; its a fundraiser for Children’s Hospital cardiac care, a brilliant idea initiated by Marie Campbell who is a nurse in that unit. Among those on the start line who are training with performance, Glenda the climbing kiwi, Nancy pants, the three dawgs, Terrie, Dorothy and Barb, Mark ‘Froome’ Dunn, Aussie David, Sarah ‘well-done!’ and Michele the Magnificent. Great to see everyone out for a day on the hills! 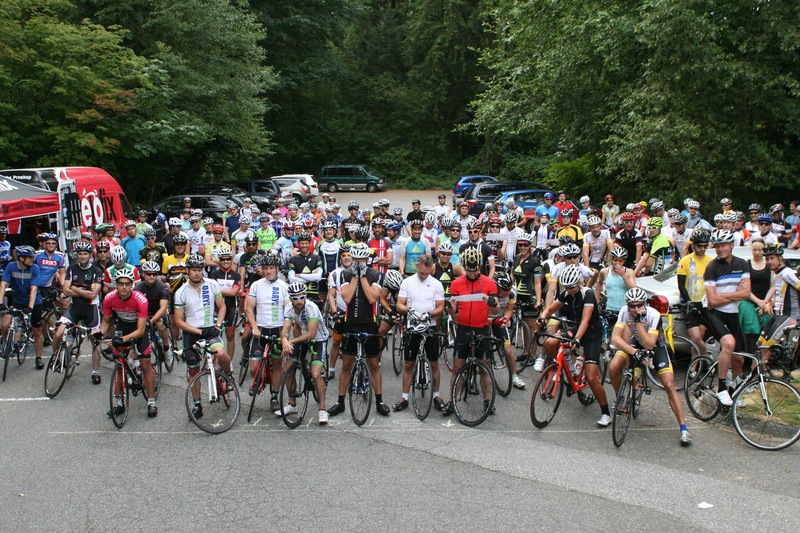 Pinned on the number, got our directions and we were off, leaving Ron Andrews Community Centre for a neutral start on Mount Seymour causeway. It was overcast, cloudy as we turned towards the climb past the park gate. The first part of Seymour is where you can set a rhythm, get in a heart rate spike. With our training and with a few km in the legs after riding over from Park Royal, it wasn’t going to put me into a deficit as it might have otherwise. Tapping it out, joining up with a group going the same pace I was lucky to tuck in behind someone to hold that pace. Doug was a familiar face in there and I met Sean. Everyone had their times of feeling stronger, then not so much. Checking off the km markers, did you see the 3k sign Michele?, using my watch to do a stand up every minute, focusing on the road ahead, but not too far ahead. We went into the clouds around 9 or 10km, rolled out of them at the top meanwhile watching the descenders, there went David, who waved! then Mark. Quick turnaround at the parking lot and back down. Back into the cloud I was focused on the road, staying close to the centre painted line as a guide. Had some fast company along the way, then it was the parkway again, with a group gathering. When we hit the new hill, 3rd Street, a sizable pack of around 20 formed, most content to let others stay on the front. Really nice big guy in blue ended up pulling us along 1st, I tried to come by to take a turn but he was hard to come around and didn’t pull over. NOTE; if you want to share the front with the rider behind, don’t stay there. I’m always content sitting behind someone who makes no move to pull off. At Capilano Road it started to thin out as the climb began, I know the road well so wasn’t in a rush, it has its 10% points and I knew that was coming up in the last km. By this time I had begun my bottle of Q with Isagenix e+ (energy drink), was about 1/2 way through it. The woman who had pulled away from me on Seymour, again pulled away and got through a light and a bunch of us were left behind. Up we went, Nancy Greene Way and the steep bit at the top. I followed a wheel ahead and went right around under the gondola, looks like not everyone did that. Then a busy descent, head up – I stay towards the centre line on this to be visible and to be able to see side road traffic. Was lucky enough to have a green light at the suspension bridge light, got the red light after that. And again at Taylor Way. And at the Park Royal light. Could see the pack ahead! Climbed up 13th with a GS guy who told me his name but I forget, nice guy with a European accent. We got up 15th, highway and to the foot of Cypress together where even though I still felt pretty good, I wanted to pace myself for the next 11km, so it was, ‘meet you at the top’. On the steep part of Cypress I like to keep the pace that I do the rest of it in, so 14-15kph (not starting at 18 and dropping down to 10kph a km later). Keeping an eye on the HR and speed I was steady, caught up to Mr GS, then a familiar body ahead, it was Doug. He had mixed with the wrong company on 13th/15th, too fast. Now paying the price. I’d had a gel at the bottom of Cypress, good to go steady to the top, pulled off a ‘normal’ time (compared to a race time, that wasn’t happening!) and really nice to have a wheel appear in front to jump on for the crossing to the Alpine area, that hurt! Wanted to get there asap at this point – hamburgers were calling me. Nice to see the faces at the finish – Leading Edge volunteers, the TCH committee members, David and Mark, great riding you guys! I got the burger pretty quick then it was watching to see everyone come in- fun to see the big smiles on everyones faces as they arrived, then to hang out in the sun, eat and drink.